HomeDiscover how RockMesh M4000 mitigated rockfall hazards in quarry conversion project. Discover how RockMesh M4000 mitigated rockfall hazards in quarry conversion project. A customized RockMesh M4000 solution to mitigate a critical rockfall hazard in a former quarry sire in East Montréal, Canada. The City of Montréal has decided to convert a former quarry site in East Montréal into a biogas plant to reduce the cities carbon footprint. During 2006 – 2012, the City issued a series of tenders to install rockfall drapery systems into the quarry to mitigate potential rockfall hazards, dangerous for both personnel and equipment present at the base of the rock slopes. Rockfall in the area is especially fatal given the towering heights of the slopes—some of which exceed 120m. In light of this circumstance, the City of Montréal decided to liaise with a group of experienced Engineers to design an appropriate rockfall drapery and Anchorage system to mitigate rockfall permanently. 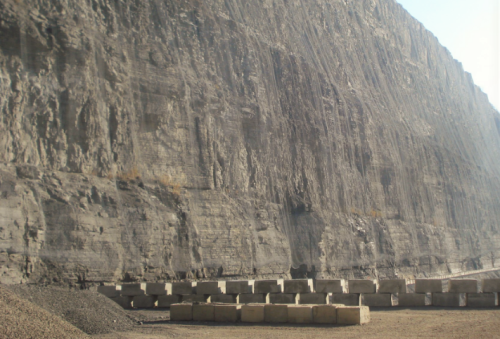 As the side walls of the quarry where very high and access to them was limited the Montreal city council requested the installment of a drapery system that could be fitted in one single piece onto the entire slope. Moreover, the board requested the implementation of a regular maintenance program to prevent the scattering of waste material such as rock debris, and also the prevention of mid-face rock pinning. Within the installation metallic cables are used in place of the conventional selvage wire to increase the connection strength and to transmit the load of the debris directly to the top anchors to reduce the stress and the deformations of the mesh. RockMeshM4000 is typically manufactured in standard 45.7m lengths, but custom lengths can be accommodated. To assist the clients wishes Maccaferri customized its RockMesh M4000 to fit the entirety of the slope. For example, as part of some of the phases, single rolls of up to 110m in length were manufactured and installed. The large 8mm diameter wire ropes that were woven into the mesh helped carry the weight of the larger rolls. Over the course of 4 phases of installation (between 2006 and 2012), approximately 70,000m2 of RockMesh M4000 was installed on site. The project was successfully terminated in 2012. For more technical details, please download the Case Study.